Conforming with the rules set forth by industry standards is essential for companies operating in safety-critical industries to reduce the risks of malfunction or failure of their products. What's more, proven compliance with certain standards is more and more often a mandatory requirement for companies bidding on safety-critical projects. One of the most important standards, IEC 61508, is a general "umbrella" standard regulating the Functional Safety of Electrical/Electronic/Programmable Electronic Safety-related Systems. codeBeamer ALM supports compliance with a variety of safety standards including IEC 61508. Compliance with standards such as IEC 61508 could give your company access to new markets, and helps build trust towards both your processes and end products, thus building your company's image. 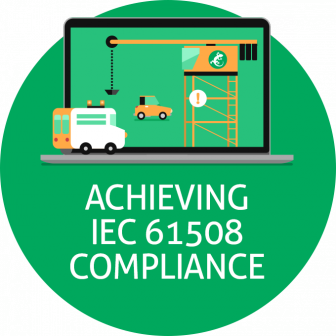 Therefore, achieving compliance gives you a competitive advantage, and finding the most (cost-)efficient way to conform with the rules and requirements of IEC 61508 yields immense business value. Let's see what aspects of development IEC 61508 affects, and how you can achieve compliance with this standard. This standard employs a risk-based approach to safety-related systems design – in other words, risk management is the primary aspect of the safety lifecycle that the standard sets out. To evaluate the product's overall risk level, IEC 61508 defines four Safety Integrity Levels (SILs), with each level representing a more stringent degree of safety regulations. When applying the standard, a target SIL has to be set and achieved for all safety functions. IEC 61508 consists of 7 sections detailing the requirements, guidelines and examples of the standard to help its users achieve compliance. It covers basics such as definitions and a glossary (abbreviations), examples and methods that help determine Safety Integrity Levels (SILs), general requirements, guidelines on applying IEC 61508, and requirements of safety-related systems as well as software requirements. Complying with IEC 61508 doesn't only require knowledge – it also requires great effort. In the following, we'll discuss Part 3 (IEC 61508-3), which governs software-related requirements. The standard regulates administrative and technical controls, change management procedures, complete traceability, identification of configuration items, and documentation & reporting. Achieving compliance with the requirements set forth by IEC 61508-3 is greatly facilitated by using a smart tool such as codeBeamer ALM that automatically takes care of some of the work. codeBeamer enables organizations to design safety-related systems up to SIL3. The risk-based approach to safety-related system design as described by IEC 61508 is fully supported by codeBeamer. After identifying risks, risk analysis defines a value for the likelihood (frequency), and the severity (consequence) of each risk. According to IEC 61508, the function of these two values should then be entered in a Risk Matrix Diagram to determine if the risk is acceptable, and what kind of mitigation action is needed. To facilitate risk management and compliance, codeBeamer offers risk trackers to store and manage risk-related information. Risks may be derived from requirements, or the other way around: risks can lead to new requirements (mitigation actions), ensuring complete traceability. The use of trackers also provides complete end-to-end traceability throughout the lifecycle, with change controls ensured: all changes to work items and documents are stored and may be browsed later. codeBeamer also allows you to deploy to a staging environment before releasing the software in the actual operation environment. It also offers document management functionality, custom wiki plugins and work item views to facilitate reporting, as well as comprehensive baselining to save the current state of all your artifacts at any given time. As a complete, integrated end-to-end ALM solution, codeBeamer covers all phases of the product development process. 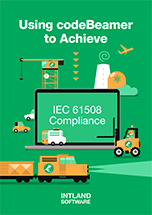 For detailed information on how to use codeBeamer to achieve compliance with IEC 61508, download our free compliance guide below. Have any questions? Contact us, or start your free trial of codeBeamer ALM right away!